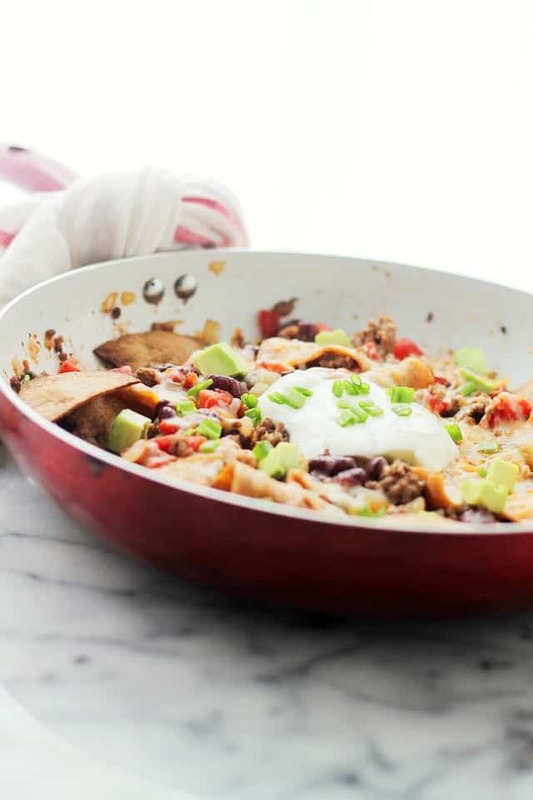 Skillet Burritos – One-Skillet dinner ready in 30-minutes, combining all your favorite Mexican flavors! Happy Sunday, you guys! How you doin’? As always, I really hope you’re enjoying a mellow, happy Sunday with a full-on marathon of your favorite TV shows! In this little corner of the world, it’s October and I have never been SO COLD! I’m practically freezing out here. I hope this doesn’t mean that Winter is going to make me stay inside for months. I’m kinda bad about going outside when it’s cold. I just don’t go. The only way you’ll get me to go outside is if there’s a raging fire inside the house. Also? I have a collection of nail polishes, yet I almost never polish my nails. And, I have every God given shade of lipstick, but just as the nail polish, I hardly ever wear it. Anything else I can share about me?? How about this. I went to school for years, got a Bachelor’s Degree in one thing, a Master’s in another, yet all I ever wanted to do was cook. And talk. Guess I need a cooking-talk show. Then, I can make Skillet Burritos and talk to you at the same time! I’m so ready to just stuff my face with all the warm, filling, very comfy food. It’s cold, it’s rainy, I’ve got my husband’s sweater on, my socks rolled up, and well, I’m more than ready to put on my fat pants – they’ve had a few months off, and it’s time to break into them again. What I’m trying to tell you is that, this skillet right here? And all that good stuff in there? It’s all in mah belly. ALL OF IT. Minus the skillet. I didn’t share. I ate it. Literally inhaled it. This meal is my almost all time favorite thing. I say almost because I wanna leave room for the next thing that comes along. But, coming from someone that doesn’t care THAT much about Mexican food (Please don’t kill me!! 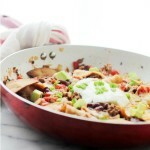 ), these Skillet Burritos are the bomb! I used to make this a lot back in the day when I was preggo because it comes together fairly fast and it’s dang-delicious. If I could do one thing right now, it would be to crawl into that kitchen behind me and make this for dinner. We hadn’t had it in soooo long, and now all I wanna do is eat it over and over again. You know what else?? 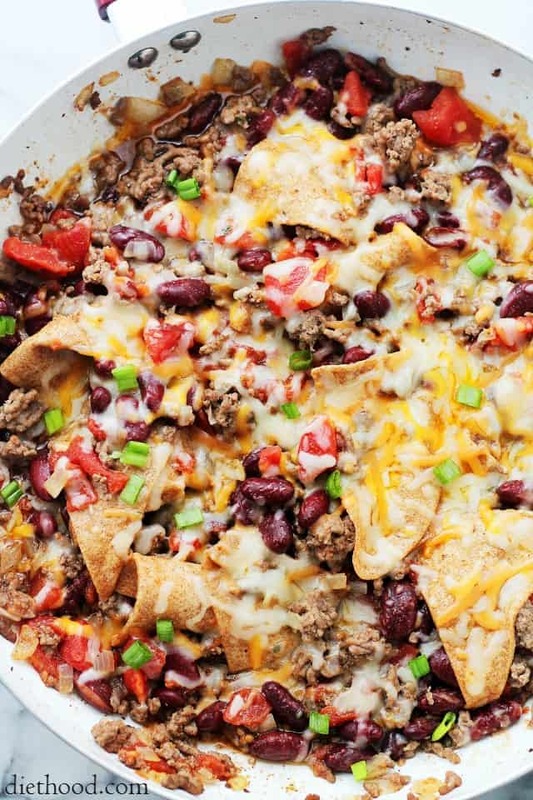 If you don’t include the flour tortillas, and if you serve tortilla chips on the side, this can also serve as Nachos!! See what we did there? We made two meals out of one. YAY US! Now, let’s get off the couch and make dinner. I know, it’s not easy to walk away from RHONJ, but somebody’s gotta make dinner, boo! One-Skillet dinner ready in 30-minutes, combining all your favorite Mexican flavors! Heat olive oil in a large skillet; add onions, season with salt and cook for 2 minutes, or until translucent. Add beef and cook until browned, stirring occasionally; drain. Return to heat and season meat with cumin, paprika, chili powder, garlic powder, salt and pepper. Stir in tomatoes and kidney beans. Lower heat to medium-low and continue to simmer for 7 minutes. Add cheese on top and remove from heat. Cover skillet and let stand for 5 minutes, or until cheese is melted. Garnish with yogurt or sour cream, avocado, and green onions. I don’t normally comment but this is a family favourite and I had to let you know. I’ve cooked the recipe exactly as is AND I have left items out when I simply don’t have them on hand. It has always come out great. Thanks for this easy peasy delish recipe! Do you cook the tortillas before mixing them in? Should the tortillas in the dish be soft or hard? Hi Ashley! Unless you’re using unbaked flour tortillas (dough), the tortillas don’t need to be cooked beforehand; they will just heat through when you stir them in. I hope that helps. 🙂 Please let me know. Loved this recipe. Tried it last night, turned out to be really good. I increased the amount of chili and cumin spice – I like it spicy. I also added some Tony’s creole seasoning in the end. I was trying to upload the picture. There wasn’t an option. Thank you. Used ground turkey instead of beef, half the cheese, greek yogurt and added a cup of frozen but thawed, corn. Family loved it; even the little one who won’t eat ground meat! Not a bite left in the pan. Why won’t the recipe load? Worthless. Worthless? It could have been something on your end… hitting the refresh button might work. I am also a nail polish, lipstick collecter! I wear mostly the same colors but am always compelled to by more! Can’t wait to try this recipe! This is my kind of recipe! 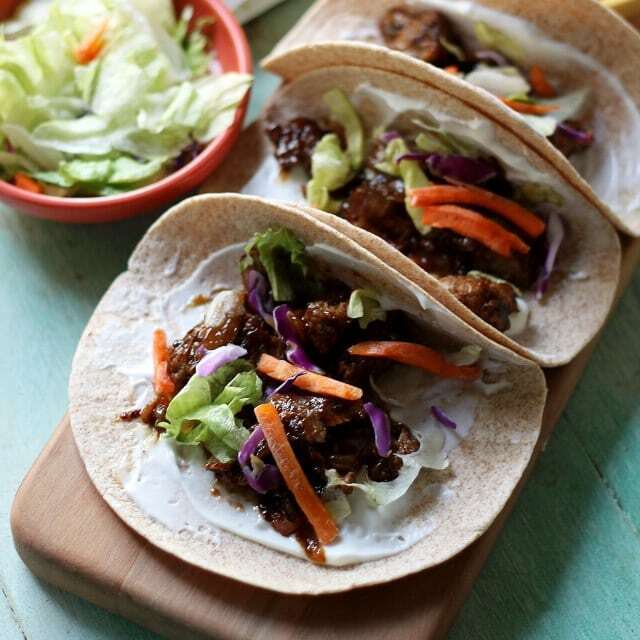 Love how simple, quick and easy it is – definitely perfect for a delicious weeknight meal. Our kind of family meal without a doubt, looks amazing! I could eat all of this by myself, too. 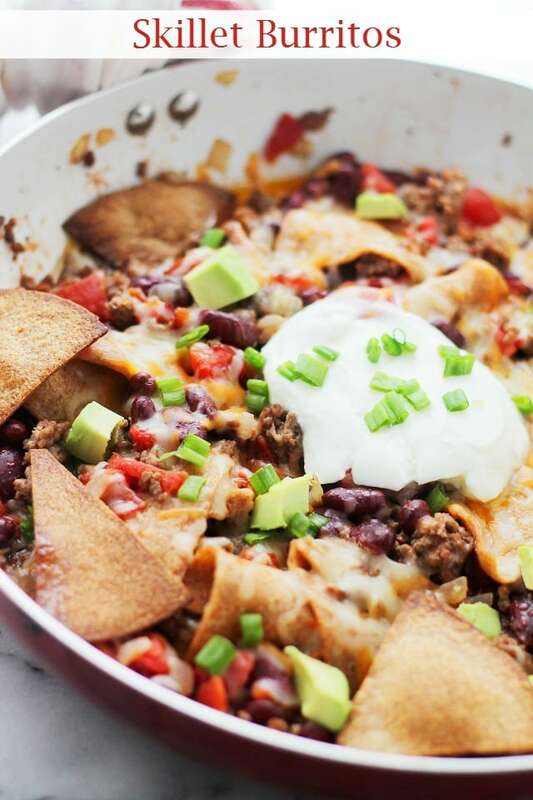 In fact, I made a pan of nachos the other day and it was about the same amount of food as your skillet burrito recipe. I ate ALL of it. Maybe I felt guilty afterwards but it was totally worth it and I will do it again. Especially if I make this recipe. Looks good, Kate! I went undergrad for 4 years, graduate school for 5 years and post-graduate school for 4 years and all I wanted to do to was cook and talk!!! 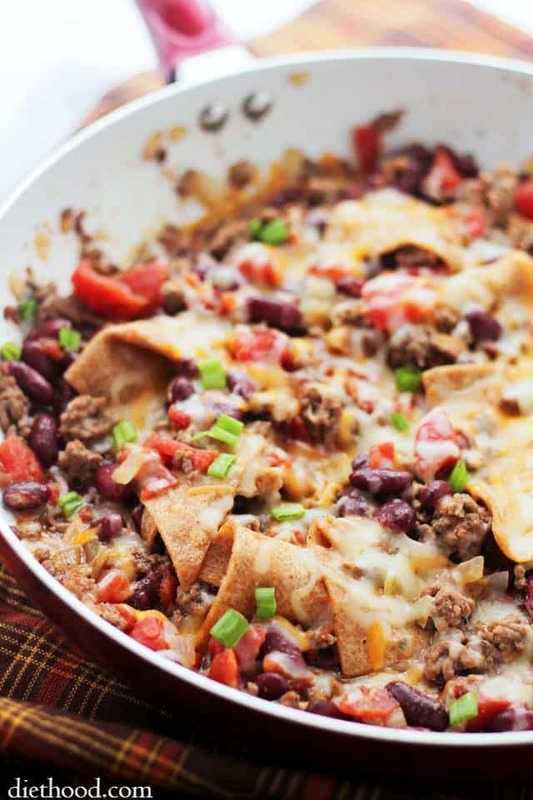 These skillet burritos look amazing. I want to shove my whole face in my pan! 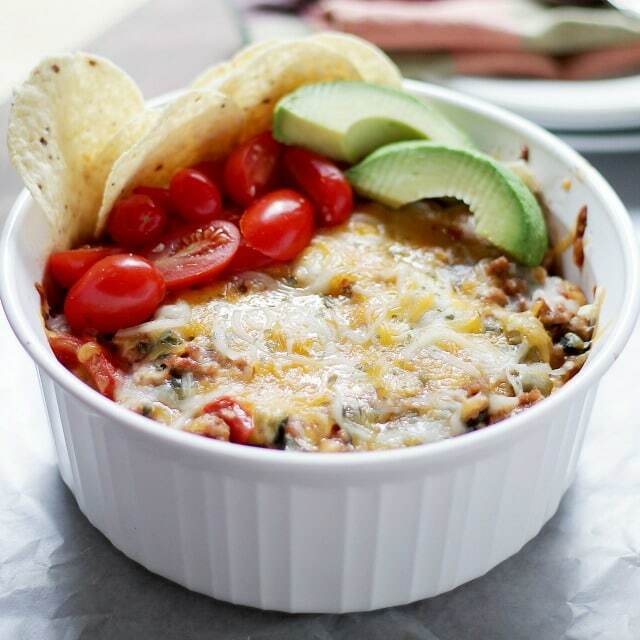 The whole dish in one pot … great idea. And if I serve it in those lettuce wraps it’s an Asian/Mexi fusion dish. I love this easy burrito dish! No rolling up tortillas so yay! I’m already in my don’t leave the house mode. I try to get out once a week. But if thar below zero business happens again, all bets are off! I will take that nail polish off your hands, though 🙂 I do my nails at least once a week. Annnnnddd, this dish looks fab. I just need a fork! Not really, a lot of people put kidney beans in their chili here. Definitely stretches the meal a lot longer. And to OP, thanks for this recipe! I think I might make this tomorrow.